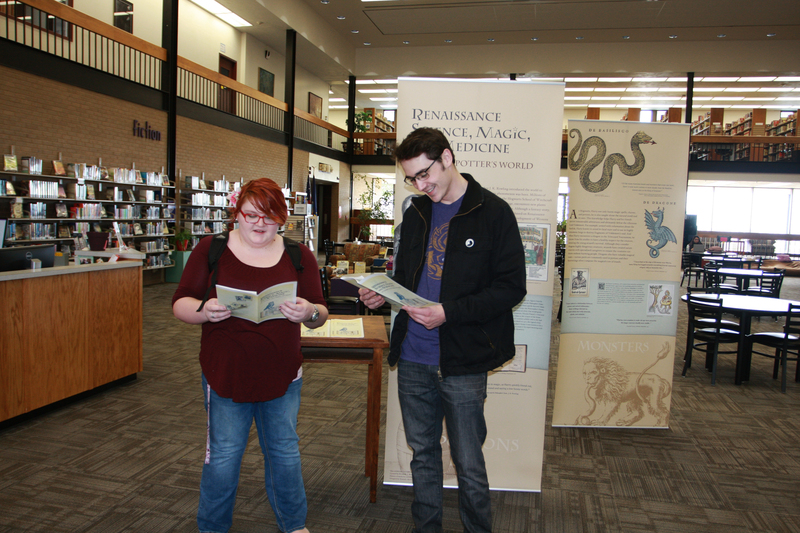 A new exhibit inside the Learning Resource Center on the campus of Dodge City Community College explores how magic became science, and how popular fiction mingles fantasy with real science. “Renaissance Science, Magic and Medicine in Harry Potter’s World,” is a traveling exhibit produced by the U.S. National Library of Medicine. Alchemy, the process of transforming base metals into gold, and the ancient precursor to chemistry, figures heavily in the plot of J.K. Rowling’s book, Harry Potter and the Philosopher’s Stone. Throughout the book, Rowling laces the strings connecting ancient alchemy to modern science through Potter’s quest for magical knowledge – adding depth and legitimacy to the narrative while illustrating the role arcane investigation has played in established science. Shelley Huelsman, director of the LRC, brought in the exhibit. She said she hopes the subject matter illustrates how real-life events and people can help shape literature. “Alchemy and herbology were real things, and Nicolas Flamel was a real person doing early scientific study,” Huelsman said. “Writers create a whole world around their discipline,” Huelsman said. “We often don’t realize the connection to real science and history. The ambition of Renaissance-era alchemists was to create the Philosopher’s Stone, able to turn all metals into gold and to produce an elixir that would grant eternal life. One of history’s most renowned alchemists, Nicolas Flamel, appears in the book as the creator of the magical Stone. Many from Flamel’s time believed that the 15th-century scholar and scribe had successfully created the Stone and, despite his death in 1417, the legend of his immortality continued. Flamel and other alchemists’ attempts to create the Stone by experimenting with metals influenced the development of modern chemistry. Alchemy and herbalism in the quest for riches and a long, healthy life were basically the STEM education of the time – driving rudimentary methods and discoveries that would eventually lead to real scientific principles. Incorporating the work of several 15th- and 16th-century thinkers, the seven-part series examines important ethical topics such as the desire for knowledge and the responsibility that comes with power. The exhibition, using materials from the National Library of Medicine, explores Potter’s world, its roots in Renaissance science, and the ethical questions that affected not only the wizards of Harry Potter, but also the historical thinkers featured in the series. In addition to featuring selections from the Harry Potter series, Huelsman also has the work of Deborah Harkness on display. Her “A Discovery of Witches” series also blends alchemist science and history, and is soon to appear as a television series on A&E. The exhibit is not interactive, but the NLM created a website devoted to exploration of the exhibit. The site provides learning modules as well as extensive supplemental material that delves further into esoteric Renaissance traditions and practices that contributed to the development of modern science and medicine. 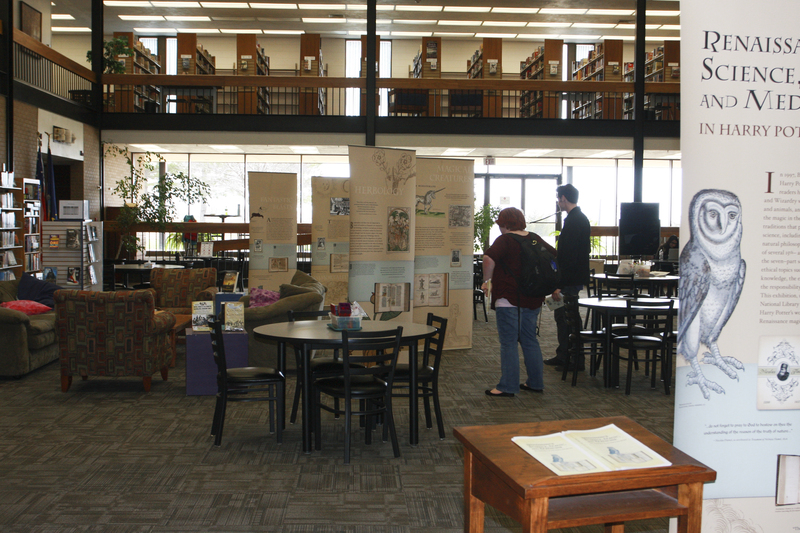 The exhibit has toured since the spring of 2009 and will be on display at the LRC through the end of the semester.